MANILA, Philippines — The Professional Regulation Commission (PRC) and the Board of Electronics Engineering (BEE) released official results of October 2017 Electronics Technician (ECT) board exam on Friday, October 27 (today) or in four (4) working days after the last day of exam. The full list of passers, top 10 (topnotchers), top performing schools and performance of schools are available on this page as announced online. PRC administered the ECT licensure exam in the cities of Manila, Baguio, Cagayan de Oro,Cebu, Davao, Lucena and Tuguegarao on Monday, October 23, 2017. 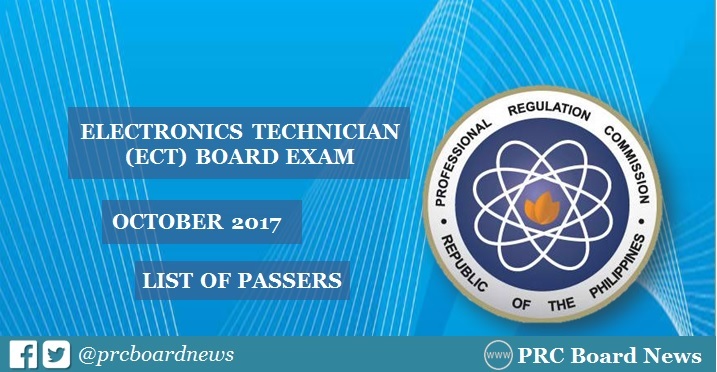 The October 2017 ECT board exam covered the technical subjects, laws and ethics: basic mathematics, Ohm's Law, Electronic/Electrical Machine or equipment, test equipment, electronic/electrical component, maintenance and repair, Philippine electronics and electrical codes and R.A. 9292 or the Electronics Engineering Law of 2004. According to PRC Resolution No. 2016-1019, the target release of results for the recent ECT board exam is on Thursday, October 26 or in 3 working days after the last day of exam. In the same period last year, results were released in three (3) working days after the exam. A total of 1,914 out of 4,742 (40.36%) successfully passed the tests. The results of October 2015 exam were also out in 3 working days. PRC named 1,784 out of 4,467 passers of the ECE board exam. Electronics Technician board exam's verification of ratings (passers, non-passers and removal) can be done online. Check out PRC's "Verification of Rating" service and enter the required information to verify your identity. Note that details will be available in few working days after the release of results. Good post,Your blog is superb and your work is beneficial for me. Each time you post the important article and recordings which educate me. It is the one of a kind method to show the exercise in this sort of the video and get info to click on https://www.essayeditor.biz/our-essay-editing-services/paraphrase-essay-service/ if you wanna to get quality work. Here in this video, young ladies playing the astounding music and getting a charge out of. An official result is moved and molded for the individuals. The range of the concept and visits of the https://www.reportwritingservice.net/our-writing-a-lab-report-services/ballistic-pendulum-lab-report-writing-help/ are ranked for the individuals. The theme collection is fixed for the routines for the future positives in life. Official results of October are matched with the highest result of the town. The ability to look here is defined for the approval of the documents. The match is defined for the sensitive items for the humans.